For quite a few years now, I have attended at least a portion of the annual Venice Film Festival. This year it ran from August 29th through September 8th. I was only able to stay there three nights this time, but I did see four films and had some terrific meals. First, the films, in the order I watched them. The Mountain, directed by Rick Alverson and starring Tye Sheridan, Jeff Goldblum and Hannah Gross. Synopsis from IMDb: The story of a young man who, after losing his mother, goes to work with a doctor specializing in lobotomies and therapies. First, let me say that I like quirky movies. That’s one reason I go to a film festival, after all. Second, let me say the last time I walked out on a film was probably 30 years ago. Well, and you might see where this is going, I walked out on The Mountain. I really can’t come up with any mildly positive things to say about it. The story was boring, the acting was unemotional and stilted, the cinematography was poor, and there were just too many long shots of nothing. I mean a shot of doorway with a chair next to it that lasted 25 or 30 seconds. I generally am patient with artsy tricks like that, but not in this case. I sat through about 40 minutes of it and regret that I could have had two glasses of wine in that time. Synopsis from IMDb: The night long journey of 4 soldiers discharged from the army. That synopsis actually is pretty wrong. It was a farce about an attempted military coup in Turkey that failed. I was interested in that story line because I lived in Turkey for two years (a very long time ago, but it is a country I still think about) and well, there WAS as failed military coup not too long ago. Actually, I see that event as more a purge by Turkey’s crazy Dictator-President, but let’s not get political. This film was good but not great. The depiction of the band of military men who were pretty much screw-ups was at times entertaining, but I think the story got kind of confused. In one scene there might have been a brutal murder, in the next scene a farcical look at how even the best plans can go badly awry. In the end, I was not sure if the film was meant to be sad or funny. Still, I watched the whole thing, so that’s something, right? This movie was awarded what is called “The Special Jury Prize” in the Horizons Category. Tel Aviv on Fire, directed by Sameh Zoabi and starring Kais Nashif, Lubna Azabal and Yaniv Biton. IMDb: Salam, an inexperienced young Palestinian man, becomes a writer on a popular soap opera after a chance meeting with an Israeli soldier. His creative career is on the rise – until the soldier and the show’s financial backers disagree about how the show should end, and Salam is caught in the middle. This was, hands-down, the best film of my weekend. It was funny and poignant and featured a complex intertwining of real action and scenes from the imaginary TV show. The writing was nearly perfect, offering interesting characters, believable conflicts and a very clever ending. At a Q&A session after the screening, director Sameh Zoabi, who seemed a bit surprised by the enthusiastic reception he received, said when he was growing up in Palestine, soap operas was what he watched on TV (because his Mom controlled the remote! ), and he wanted to pay homage to that genre. Kais Nashif was awarded the prize for Best Actor (again, in the Horizons Category). I think it is likely Tel Aviv on Fire will get some international distribution, if it comes to your town, it is definitely worth seeing. IMDb says: In 1850s Oregon, a gold prospector is chased by the infamous duo of assassins, the Sisters brothers. I am pretty sure this film will be very popular. The directing is excellent, in particular the gun fight scenes. In fact Audiard was awarded The Silver Lion Prize for Best Director. I thought John C. Reilly was fantastic, and Riz Ahmed was also quite good. Joaquin Phoenix had what I think was a pretty easy part – a savage drunk in a western – but I think he overdid it. Jake Gyllenhaal was not bad, but had a very strange and off-putting accent that I just could not figure out. I read the book of the same title (written by Patrick deWitt) and absolutely loved it. I think Audiard’s screenplay was why I did not feel the same about the film. Specifically, in the book the dialogue between the two brothers was witty and concise and very entertaining. Not so much in the film. Also in the book Eli (John C. Reilly in the film) developed a touching relationship with his horse that made the character much more interesting. The film made a feeble attempt to show that, I think, and the Eli character suffered a bit in my opinion. 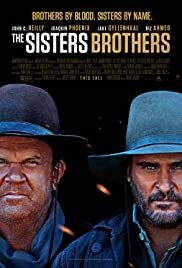 Nonetheless, I believe The Sisters Brothers will be well received by audiences and urge you to see it when it gets wide release. Keep in mind the Film Festival in Venice is out on the island called Lido. It is mostly residential, but has a very long, very nice beach that attracts thousands of visitors during summer season. Like the main part of Venice, the many restaurants serving tourists on Lido can be both horribly overpriced and terribly under quality. Not these three. I get that is probably the worst name ever for a restaurant but don’t let that fool you. The food here is quite simply amazing. Yes everything is either vegan or vegetarian but the guys in the kitchen (which is open for you to watch what they are doing if you are interested in that sort of thing) really know what they are doing. I have dined here many times and will continue to do so as long as I am a regular Venice visitor. The picture of the salad on the left, above included quinoa, feta cheese, basil, loads of finely chopped bell peppers, three kinds of tomato and more. Fantastic. Located right across the street from Lido’s ultra chic Hotel Excelsior (you can not afford a room there, no), this family-run restaurant serves Tuscan specialties. The middle picture is a pasta dish served with mixed mushrooms and assorted veggies. You might be able to pick out a chili pepper in the photo, as well. Because Tavernetta is located in such a convenient spot for the Film Festival, I always eat here. The food is excellent and in spite of its popularity with a high-maintenance movie crowd, the service is relaxed and spot on. This spot, very close to one of the cinemas where films are screened used to be a simple Italian trattoria. About a year ago they changed the menu for evening meals to feature Burgers and Tex-Mex fare. I am always on the look out for good Mexican cuisine over here. It has been a long time in coming, but Europe is finally starting to get a few excellent Mexican restaurants. Frankly, this is not one of them. The chips and salsa were very good, as was the guacamole that came with it. But the tacos missed the mark. I also tried the veggie burger (another thing I research frequently) which was not bad but not great. During non dinner hours, they serve standard Italian dishes here. Sadly, this might be the last time I attend the Film Festival in Venice as it seems pretty likely I will be moving back to the USA next year. Nothing is certain on that front, but if it happens I guess I will just start writing about the Sundance Film Festival! This time I’ll talk about the disappointing movies I saw at the Venice Film Festival two weeks ago. I don’t like to dwell on negatives, so promise to be brief. In the meantime, the pictures I have included in this post are shots of various pieces of graffiti I have found in Venice. Normally I love short films. Unfortunately, unless you live near an art-house cinema they can be hard to find. One of my favorite features of this terrific film festival is access to many, many shorts. This year I watched 14 of them but I was not impressed. Here is a list (title, country where it was made, director’s name). My friends appreciated “L’ombra della Sposa” citing the special effects and the artistic filming. The dialog is a poem written to pay homage to the victims of a boat that sank between mainland Italy and the island of Sicily during WWII. I felt it was over dramatic to the point I stopped feeling sympathy for those victims and just wished they would shut up. But that’s just me. The one I liked most – or more accurately disliked the least – was “The Knife Salesman.” It was comical, dealing with a door-to-door knife salesman visiting a the home of a frustrated housewife and mother. Plenty of clever sexual innuendo to keep the story fresh and interesting. All told, though, the shorts this year were less than mediocre. I also saw “Into the Night,” part of honoring the great director John Landis (“Blues Brothers” “Animal House” “American Werewolf in London” etc.). Made in 1985, it starred Jeff Goldblum and Michele Pfeiffer, with cameo appearances by Dan Aykroyd, Paul Mazursky, David Bowie and many others. While it was fun to see those actors young again and there were some funny bits, the story was really pretty stupid. I never cared much for Goldblum as an actor and this movie gave me no reason to change that opinion. I do think Pfeiffer is quite good, but this had to have been one of her first big roles and she was just OK. Best part of “Into the Night” was the soundtrack that featured lots of songs performed by the late great B.B. King. As I do pretty much every year in late August – early September, I headed to Venice for the annual “Mostra Internazionale d’Arte Cinematographica” or Venice Film Festival. Over the last nearly 20 years I have attended, the festival has grown more glamorous (measured by the star power present), more important to the industry (measured by the number of big studio premiers), and more expensive (measured by violent wallet shrinkage). Nonetheless, as a film festival Venice continues to deliver. I’ll be writing three separate posts about my experience this year. In them, I’ll add gratuitous pictures of Venice or of the food I ate while there. I do that not because it has anything to do with movies but because I get how lucky I am to live less than an hour away from that beautiful place. In this, my first post, the focus is on the big release films I saw. “DOWNSIZING” written and directed by Alexander Payne (best known for “Sideways”), starring Matt Damon, Kristen Wiig, Christoph Waltz, and Hong Chou. This film deals with an interesting solution to global problems of overpopulation, depletion of resources, and environmental deterioration. First, shrink people to about six inches tall, then set them up in Utopian societies where resources are plentiful and problems are few. I rate the movie as pretty good. Needless to say, the things that make humans interesting, irritating, endearing and – well, human – exist if we are six inches tall or six feet tall. Fortunately the story in “Downsizing” does not get preachy about social consciousness themes and sticks instead to the character traits (or flaws?) that make us who we are. Technically, Payne has put together a proficient movie. The special effects that juxtapose downsized people into a full sized world are seamless and clever. Look for the delivery of full sized wedding rings to a small Matt Damon. Damon and Waltz both give adequate performances. A disappointment to me was that Kristen Wiig is only on screen for maybe 10 minutes. Hong Chau, on the other hand, is terrific. She has a great role and simply nails it. I predict she’ll earn a well-deserved Oscar nomination. She really carries the movie. “LEAN ON PETE” directed by Andrew Haigh, starring Charlie Plummer, Steve Buscemi, Chloe Sevigney, Steve Zahn. This is a film about a 15 year old boy (Plummer) who wants a home, some food, and to be on his High School football team. Stability is hard to find though, and he ends up taking a summer job with a washed-up horse trainer (Buscemi). He befriends a kind jockey (Sevigney) and a failing race horse named Lean on Pete. Based upon the novel by Willy Vlautin, the story is about refusing to give up hope. I also rate this one as pretty good. The story is moving, at times difficult and at times tender, but never too sentimental or sappy. Director Haigh cites a John Steinbeck quote, “It is true that we are weak and sick and ugly and quarrelsome. But if that is all we ever were, we would millenniums ago have disappeared from the face of the earth.” I don’t know what that has to do with this movie, but if John Steinbeck said it, it is worth repeating, right? The directing is good, but (not being a film maker) I don’t think it was too challenging – most of the film is short scenes with the boy talking either to an adult or to the horse. As for acting, don’t get excited about seeing Steve Buscemi or Chloe Sevigney, or Steve Zahn. This is a movie for Charlie Plummer. I had not seen him in anything before, but have looked up his body of work and say this: he has really strong potential. For me, the young actor is not ready to take on a role where he is in every single scene, but he does indeed have talent. Look for him in a few years to be a big Hollywood star. “OUR SOULS AT NIGHT” directed by Ritesh Batra, starring Robert Redford and Jane Fonda. Two elderly folks living alone across the street from each other decide to hook up. Really. I rate this as OK.
Let’s face it. The story does not matter, the directing does not matter. This is a vehicle for Redford and Fonda to once again light up the screen. They both have had extraordinary careers and have earned respect for their work. The writing is too sentimental and sweet for my taste, almost saccharine. Nothing special about directing in this one, just point the camera at the two actors and stay out of their way. Of course these two have made a number of really terrific movies together, and I am happy to say they still have it. The chemistry between them works and you believe they care for each other. Their performances are very good indeed. A friend of mine who saw it with me (widow, in her late 50’s) said she could relate to the need for companionship, so she liked the movie. Me (early 60’s, married), I think it isn’t much more than a sappy film with two great actors.